You’ve got some hand to hand self defense skills. You recognize that certain situations require more force to survive, but you can’t legally carry a gun everywhere. That’s where edged weapons – knives, fit in. 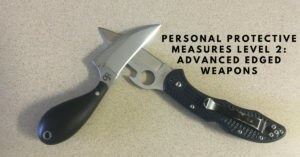 Personal Protective Measures Level 2: Advanced Edged Weapons gives you the necessary skills to use your defensive knife to survive a multitude of dangerous situations. WHAT IS PERSONAL PROTECTIVE MEASURES? Personal Protective Measures is a modern, comprehensive form of self defense. This program focuses on the most essential fundamentals to effectively deal with the weapons and dangerous situations that you may face in today’s modern context, all the while staying within our legal framework. It is NOT a martial arts style with flashy unrealistic moves. It is easy to learn. Simple to apply. And most importantly, it WORKS! Knife fighting drills vs. knife, impact weapons, etc. The curriculum is constantly evolving and not stuck in tradition. It is a dynamic course that adjusts to new threats, new scenarios, and new weapons as they present themselves. If you regularly carry a firearm as part of your personal defense gear, you are welcome to bring inert training versions of those items. NO LIVE FIREARMS! Good attitude, open mind, and a willingness to work! To schedule your free Bujinkan Martial Arts trial class, please click on one of the highlighted days and fill out the form. We’ll confirm your spot within 24 hours. Feel free to call us at 205-490-8340 if you have any trouble finding the location.